A summary of the major pieces of evidence uncovered by the investigation into Rob Young's attempt to run across the United States in record time. Most of this data is compiled from the long thread at LetsRun. The core of the argument against Rob, and the catalyst for the investigation, was his supposed pace. According to data available from the GPS tracker (later corroborated with GPS uploads), Rob was claiming to run astoundingly fast through much of his journey out west. How fast? There were multiple stretches of 10+ miles at sub 7 and even sub 6 minute mile pace. This run (backup) shows someone running 25.5 miles at an average of a 5:40 pace, at over 6500 feet in elevation. Incredibly, the runner starts at over 8500 ft of elevation and maintains a sub 6 min/mile pace for four miles as the road continues to climb. The first consideration is that none of Rob's listed runs on the runbritain rankings demonstrate a fitness anywhere close to that level. His fastest verified marathon (London, 2015) was completed in a time of 3:07, which comes out to an average pace of 7:08 minutes per mile. This was at sea level, and presumably involved some rest beforehand. The previously mentioned run started at an altitude of 8500 ft, and was in the midst of enormous daily running efforts - 30, 40, and 50 mile days. Even if Rob had demonstrated the ability to run a sub 2:30 marathon, it would not make this data more believable. The problem with running fast for long distances is that its just not sustainable. The body breaks down. Consider the Western States 100, a well established 100 mile ultra marathon that takes place out west. The course record, 14:46, translates to an average pace of 8:51 min/mile. This is the course record. That means that the fastest time that any of the multitudes of elite, well rested, ultra-marathoners could manage was almost 9 minutes per mile. Finally consider two graphs. 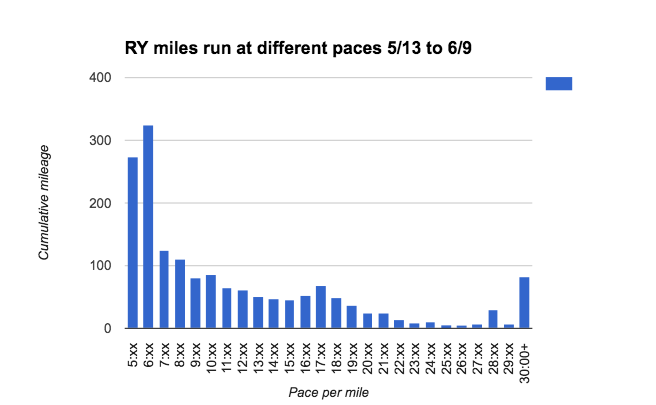 This graph is a histogram (count) showing the number of miles claimed by Rob at each pace up until 6/9 (according to tracker data). This graph shows the same histogram for a 6 day, 606 mile effort by Joe Fejes, a well known and elite multi-day runner. Notice the stark differences. Joe does not run a single mile under 7 minute/mile pace. Rob claims to have run several hundred. For now we can ignore the runner who tried to find Rob in the middle of the night, but only found an RV moving slowly by itself. Ignore the gas station security footage that shows the RV passing by with no runner in sight. Instead, consider these quotes from respected ultra runner Gary Cantrell, aka 'Lazarus', founder of the infamous Barkley Marathons. Gary and a team of other ultra runners shadowed Rob from June 12th to the end of his record attempt. Gary and the team of ultra runners, or "Geezers" as they called themselves, began round the clock observation of Rob on 6/12. This graph shows the number of fast miles run by Rob before and after the Geezer's arrived. Never mind that most of the PR's listed on his website are all significantly faster than any run found on his Run Britain rankings. Forget, for a second, that he claimed to be a pro cyclist in his book, and that somebody attempted to upload pictures of professional cyclists with his name to Wikipedia (most of these photos have since been deleted, but you can see a copy here). Instead, consider the story of his first marathon(s). In his book, Rob claims that without any training or preparation, he ran three "marathons" (marathon length runs, not actual races) in less than two days. One in the morning (4:07), one in the evening (3:28), and then a third the next morning (3:19), with only four hours of sleep in between. Notice that they get progressively faster. To any experienced runner this claim is absurd. Running a fast marathon is hard, even with training. To do so, without training, back to back to back like this (and as we find out later, the rest of the week), all while setting new personal bests, is very hard to believe. Duplicating this feat (with these exact times) might be possible for an elite marathoner or ultra runner, but it would require significant training and preparation, not the spur of the moment idea that Rob describes. Much time has been spent scrutinizing the data uploaded by Rob, both on this blog and on the forum. Here are some of the highlights. Note: to see extra pacing information on Strava you need to create an account. This run (backup) shows a 24 mile stretch west of Flagstaff run at 6:37 min/mile pace at more than 5000 ft of altitude. The astounding pace remains relatively constant, even as the road climbs nearly 1500 feet. Between miles 16 and 18 the runner's pace increases to sub 6 and even sub 5 min/mile, in the midst of a significant climb. Here are a few more very impressive runs: 6.5 miles at 6:20 min/mile pace, 13.8 miles at 5:53 min/mile pace, 5.5 miles at 5:52 min/mile pace at altitude. Notice a pattern. Besides being unbelievably fast, they all take place at night, in relatively rural areas. This histogram, compiled from Strava data, shows the distribution of paces by time of day. The second graph corresponds to the time period before Rob was under strict observation by the ultra runners (nicknamed "the Geezers"). Notice how in the third graph, the time period when he was under observation, the number of fast miles (red) practically vanishes. These two images show screenshots of runs uploaded to Strava by Rob. The first run can be found here, the second and more astounding run was deleted, but a similar run can be found here. Important is the graph with the blue line on the bottom of each image, it shows pace versus time. Notice in the first run the pace is erratic. The runner seems to run in spurts, then stop and walk. This is consistent with witness observations of Rob's running style. In the second image the runner maintains a consistent pace, with no obvious walk breaks, for the entire duration. The pace in the second image is nothing short of astonishing, occasionally dipping below 5 min/mile at nearly 7000 ft in altitude. Excellent job on putting this together! The evidence here is overwhelming, great job. Given that his elite backstory also doesn't check out that gives this further weight.